Posted in Guaymas, What to Do? There are many attractions to see and fantastic restaurants to experience in the port town of Guaymas Sonora. Guaymas has several great beaches nearby, including Miramar and Bacochibampo and the soft-sand beaches of San Carlos. For accommodations, there are many Guaymas hotels, condos and homes to rent. The Guaymas marinas have 798 boat spaces and boating, fishing and diving are all available. And there is an 18-hole golf course in nearby San Carlos. Guaymas Sonora is 117 km south of Hermosillo and only a five hour drive south of Tucson, Arizona. A unique, colorful and fun time to travel to Guaymas Sonora, is during the annual Carnaval when you can enjoy colorful parades, fireworks and live music. 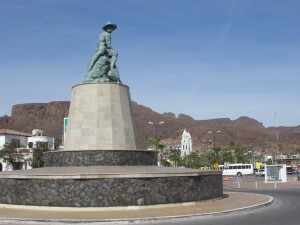 Fisherman’s MonumentOften photographed, the Fisherman’s Monument at the Guaymas malecon is the most symbolic statue of the port. The base of the statue is inscribed with the words of a sad song, “Barco de Guaymas” (Boat of Guaymas). The words tell us that when a fisherman dies, he goes to the great beyond in the boat of Guaymas. 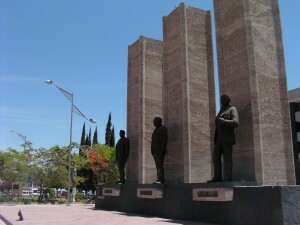 Three President’s PlazaThe Three President’s Plaza was constructed in honor of three men, Adolfo de la Huerta, Plutarco Elías Calles and Abelardo Rodríguez, who were all native of Guaymas and presidents of Mexico. 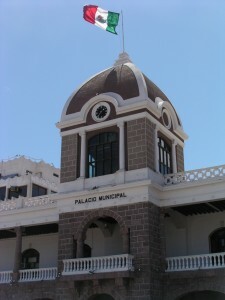 Municipal PalaceConstructed in 1899. Located downtown on Avenida Serdan between Calles 22 and 23, next to the Three President’s Plaza. Light and Water ShowThis Las Vegas-style dancing fountain light show is on each night around 7:00pm. The show is 30 minutes long and is accompanied to music. 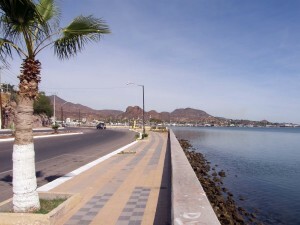 It is located along the new Guaymas boardwalk. Guaymas’ Malecon (Waterfront Boardwalk)This new boardwalk is located behind the Three President’s Plaza by the waterfront. In the evenings you’ll find families strolling on the boardwalk, and vendors selling nuts and candies. On occasion you may see musicians too. This is where the city puts on their annual shrimp fest and crab fest. When the cruise ships come into Guaymas, this is where there is usually entertainment. San Fernando ChurchConstructed in 1850, this church is the oldest in Guaymas, and is built in the neoclassic style. 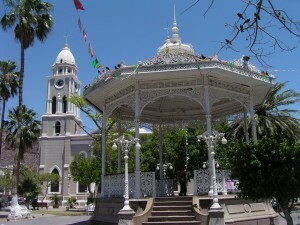 It is located downtown on Avenida Alfonso Iberri between Calles 24 and 25.13th of July Square With a Moorish-style bandstand, this square symbolizes the heroic battle between the people of Guaymas and the French in 1854. During the evenings, you will find families and couples sitting on the benches, and vendors selling snacks and refreshments. The designer of the bandstand was Gustave Eiffel, the same man who designed the Eiffel Tower in Paris, France. See more photos and videos of Guaymas Mexico.